Earlier this year, shares of The Stars Group Inc. (parent company of Pokerstars) soared due to optimism over the opening US sports betting market and the company's purchase of Sky Betting + Gaming. It was easy to see where the optimism is coming from. After all, the United States represents the single largest gambling market in the world, as you are combining the world's richest population with a love for gambling (especially on the NFL). With Pokerstars' purchase of Sky Betting + Gaming, the company would be able to offer a full-featured online gaming experience to people in the United States. BetStars was a relatively new venture that was having trouble gaining traction, though Sky Betting + Gaming is legitimately one of the largest online sports books in the world. The problem is that the market got ahead of itself, sending shares of the company soaring. At its peak, shares of The Stars Group Inc. were trading at nearly $39 on the NASDAQ stock exchange, which represents roughly a 66% increase in value from the start of the year. Throw in the pending World Cup (at the time) and you had the recipe for extreme bullishness. 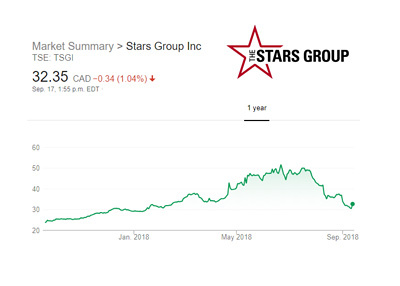 Things have changed over the past couple of months, however, as shares of The Stars Group Inc. have come hurtling back down to earth, as they currently trade at $25.68. 2. Realization that the US market is likely going to open slower than first anticipated, and that the competition in this market is going to be extremely deep. The US market opening up is obviously a great thing for companies like Pokerstars, though the competition in that market is going to be extremely fierce. In addition to all of your established brick-and-mortar operations (and their significant brands), you will also have to compete with other online competitors such as William Hill, as well as daily fantasy sites such as DraftKings, which is currently offering up sports betting services for residents of New Jersey. Pokerstars has a tremendous brand, though so do a wide range of different brick-and-mortar operations. In addition, Pokerstars is seeing a continued stagnation of their poker operations in the face of increasing competition from the likes of partypoker and 888.